So I’m not positive how this one got into round two (since clearly it is not that great nor has it been edited, ever—whoops) but it’s a good time to talk about poetry conversation in general, and I will use this poem as the example. There is basically nothing special about the original but there are lots of places to improve, so I want to update some ideas I have posted here about the ways in which to best attempt a conversation (critique) of a poem. In school we learned 1-3-1, a process of talking about a poem that included things to keep and things to revisit. 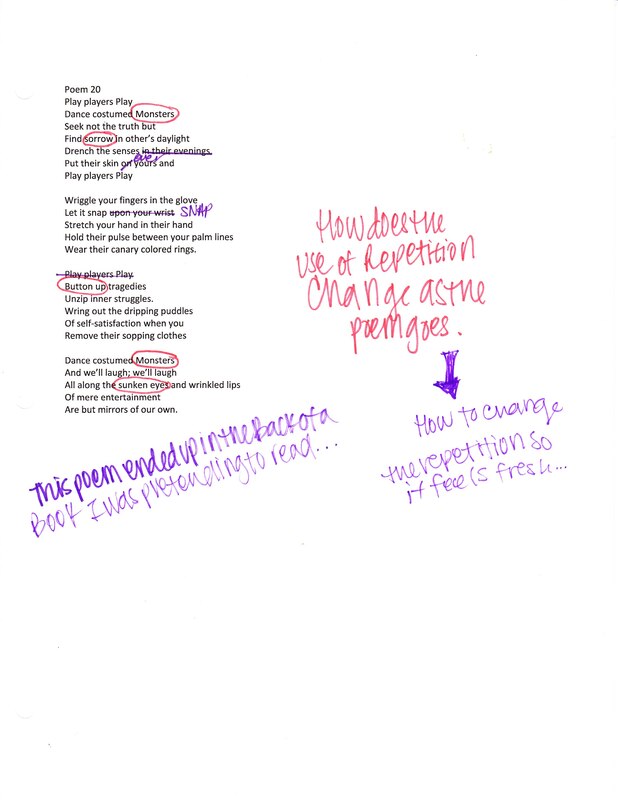 This was not a criticism nor was it a way to make the poem better by consensus (which sometimes happens in workshops when the commentators are too bossy and the poet is a little shy) but instead it offers a whole view of a poem, making a little circle from positive to negative back to positive. I have found this to be a good tool in both business settings and tutoring sessions as well as classrooms where I first saw it used. 1 – the leading line is fun and playful, setting the tone of the poem as well as making the theme transparent and accessible. b — Monsters might be a little charged of a word to choose for the subject. There are lots of connotations that come with that verbiage and they may not belong in the poem. c — clothing, being the central mode of the metaphor, can be fleshed out a little more to allow the clothes themselves to add content rather than just the stickiness to the wearer. Though this is a strong idea the visuals could use more colors, textures and shapes. 1 – The idea of watching oneself on stage is a strong and well established idea about acting and makes a good backbone for the poem. Whether reading others’ poems, helping writer friends with their projects or weeding through your own blog posts and narrative endeavors, remember to always give strong feedback in the form of suggestions instead of criticism. Opening and closing the comments with positive ideas reminds the writer that there are still high points in the writing and encourages them to improve rather than quit right then. Nothing makes a writer better than truthful, kind feedback. Kind, being a word to describe the delivery and not the content. Be as harsh and raw as you feel necessary, but always remember that someone wrote the things you read and someone took care and effort to bring those words together. We are all readers and writers in some capacity; we are also sometimes out of our comfort zone and need a little cushion. Keep writing and keep the conversations in your life alive, they might just make you a better writer!